Romanov Sheep - "Lambs by the Litter"
The Romanov sheep are from the Volga Valley, northwest of Moscow. 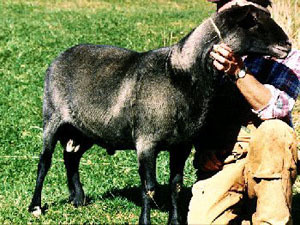 Genetically unique to North American and British breeds of sheep, the Romanov (a "pure gene" - not a "cross" of anything) used on traditional ewes, will produce a "hybrid" - high performance ewe for the flock of the future and a top gaining market lamb. Quadruplets, quintuplets and even sextuplets are normal performance for a Romanov ewe. The North American record for a Romanov ewe is seven live, healthy lambs in a litter. The Romanov breed record is a litter of nine. Romanov sheep have a phenomenal early sexual maturity. Rams and ewes are fertile by the time they are three months old. Romanov ewes will breed any month of the year. This out-of-season breeding ability, combined with the multiple birth ability allow the high production of a Romanov ewe. Lambing every eight months, it is common for a Romanov ewe to lamb three times in two years, - with three to five lambs each time. Combined with the aggressiveness of the newborns that contributes to lamb survival, impressive lamb crops are possible. Purebred Romanovs are born black and lighten to a soft silver grey as they make their fleece. The color is lost on the first cross. Most 1/2 Romanov lambs are born white (even the 1/2 Suffolk). 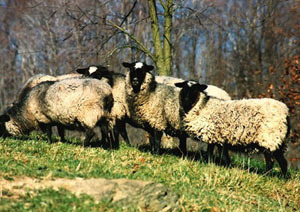 A few are born tan, grey or speckled and bleach out to look like a regular crossbred sheep as they make their fleece. The practical application of the Romanov genetics is in the development of the ewe flock. Crossbreeding to get the high performance half Romanov ewe, we have created a "market lamb machine" that will produce a 250 to 300 percent lamb crop every eight months. The hybrid advantage or "heterosis" affects rate of gain, lamb survival, fertility and litter size. Here at the Sheep Center, we believe the secret to surviving in the sheep business can be in the 1/2 Romanov ewe. She looks like a regular sheep, but can perform like a Romanov. These are tough times in agriculture. We have to get the multiple births, and they have to live to make it to market, if we are going to show a profit. This production boost is easily introduced into any flock with the Romanov genetics.